Good Morning! I hope everyone is having a great start to their week. My Monday off was a lot of fun, over way too quickly. I wish my days at work went has fast as the they do when I am at home. I would love a week like that. I have a really fun sketch at Tuesday Morning Sketches for you to play with and we're being sponsored by Digi Doodle Shop. They're offering up a $10 prize! This card also features a technique that my monthly card traders group challenged us with Inlaid Embossing. So I took a piece of white card stock as my base, and punched out circles and flowers and glued it onto the white base. 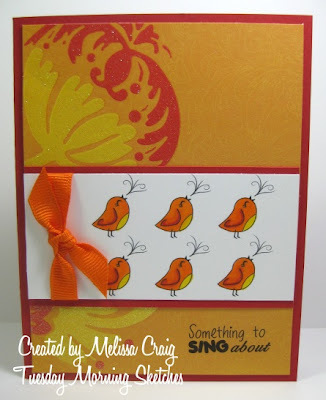 Then ran it thru the Cuttlebug with the Perfectly Paisley embossing folder. I like this technique - it was fun. It's perfect for Digi Doodle Shop's Anything Goes challenge, too. So I hope to see join us this week. Have a great Tuesday! Before I start my normal post, I need to make a HUGE apology to Nadine and Lisa. Yesterday was their birthday hop and I completely forgot about it. I do hope that your birthday brought you all that you wished for. And to Frances, I am so sorry that I messed up the hop. With that said, I can tell you that my day didn't improve much. I was creatively blocked and it took practically the entire day to get one project done! Ugh!! It's not fun when the one day you get to stamp doesn't work out so well. But I did finally come up with something. 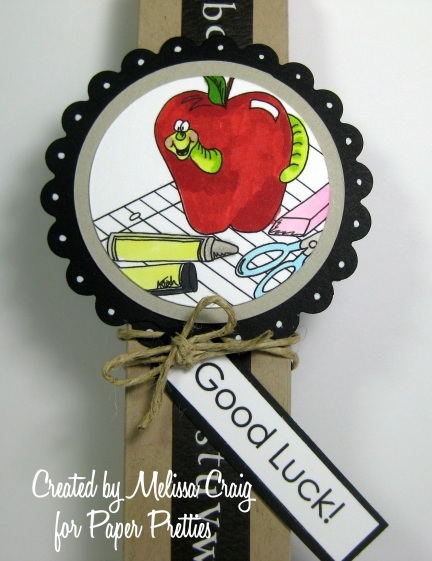 I used Back To School image and a sentiment from the Osbert Set. See below. 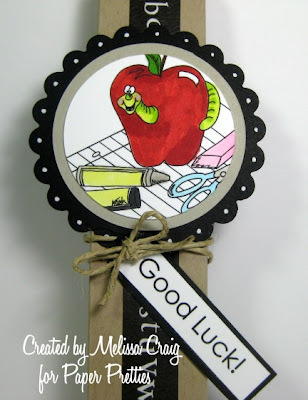 I created a pencil holder, which is a really adorable gift idea to give a favorite student or teacher. Here's a close up of the images I used. I also pulled out a really old stash of stuff. 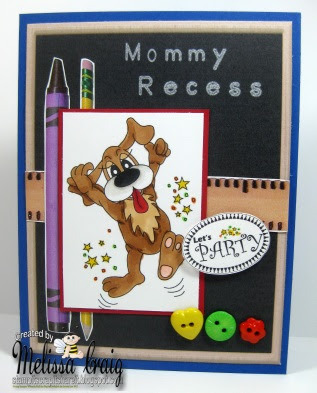 The alphabet border is from a Back to School page kit from Leaving Prints. They went out of business years ago! The natural feel to this project was set in motion by the challenge at Our Creative Corner when they said to go neutral and use black, gray and red. The box was that I found here was inspired by the Just Us Girls challenge to use a 3D template with a Back to School theme. I hope join us this week! Thanks so much for stopping by! Good Morning! Happy Thursday to you. I hope you're excited about this week's challenge over at Delightful Challenges. 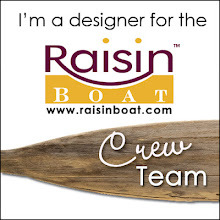 I am really enjoying being on this design team, I enjoy seeing the creations that you all make. I don't get to comment as often as I'd like, but trust me, I see it. I am thankful for the visitors that come to see me here on my little blog. I hope you like my play on this challenge. This is Happy Dance Nesbitt and I just feel all happy and have to giggle everytime I look at this image. He is so fun. 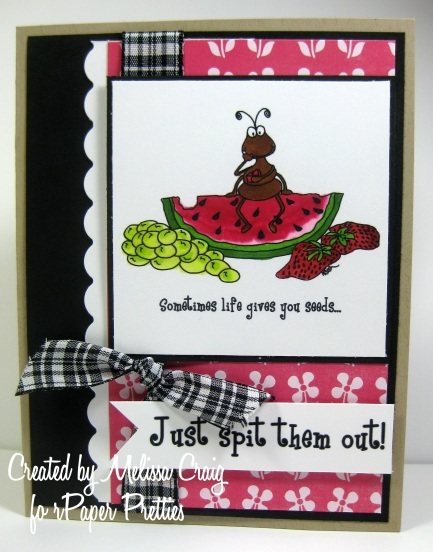 I also used Let's Party sentiment. I did use the sketch from Sketch & Stash. My stash... I used some papers that I haven't used for awhile. I hope you play along with us this week! Thanks for stopping by! Good Morning! I hope you are having a great week so far. 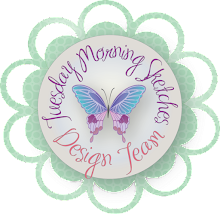 I have posted the most amazing line up over at Tuesday Morning Sketches. You have got to head over and see it! 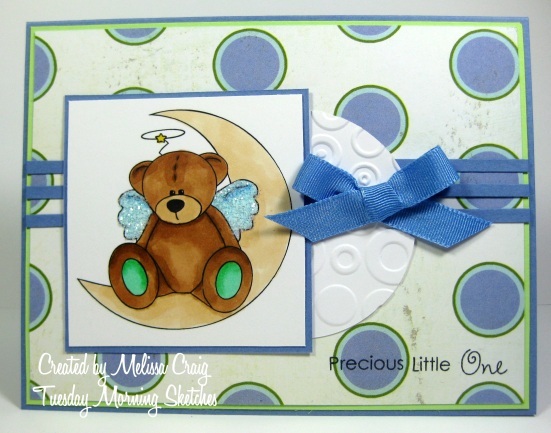 I really love the precious images Stamp Fairy has to offer and this sweet little guy was perfect for baby card with strong colors. 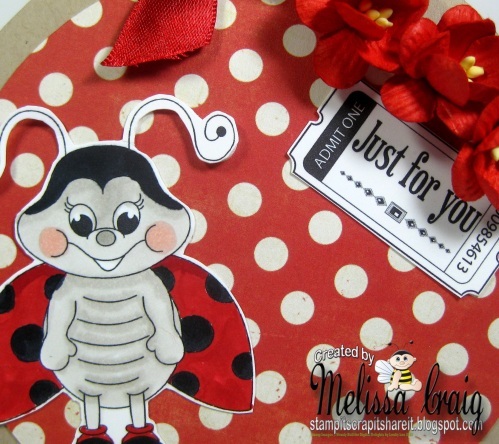 One of my favorite things every is polka dots and I really like how these work for the card without being so overpowering. I hope to see you this week. It's the judged challenge this week so do your best, but have fun! Hello everyone! This is my 2nd post today for Paper Pretties. 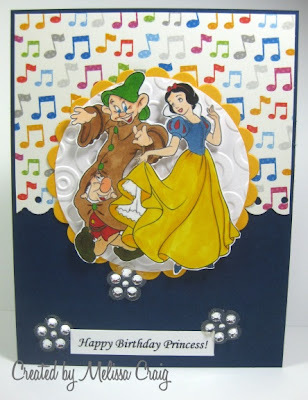 Please scroll down to visit the Happy Birthday blog hop for Jackie. 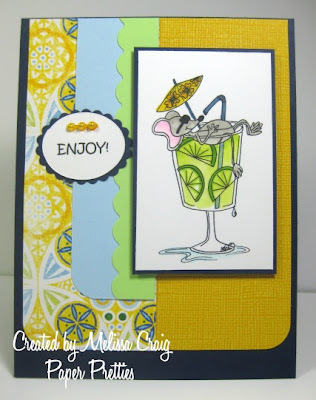 What a fun card this was to make - it actually went together relatively quickly. The ant is so cute and looks so happy to be sitting on the watermelon enjoying the sweet summer fruits. I did use a great sketch from The Sweet Stop. And here's the other new release - Chop Chop. 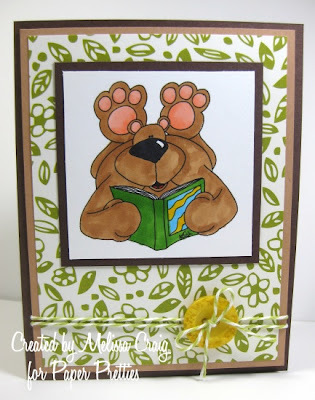 So head on over to the Paper Pretties Blog to see these new digi releases and the new stamp releases and to join this week's challenge! Have a super Monday. Good Morning! Happy Monday to everyone - it's back to school for my kids today. If it is for yours, I wish them a happy first day back. I used a sketch from Sweet Sunday Sketch - what fun this layout was. 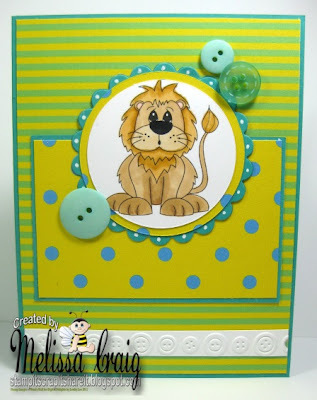 The next stop on the blog hop is Nadine's blog. Enjoy! Good Morning! I hope the week is going well for you. We're on the downhill side of this week which isn't making my children too happy since this is also their last week of summer vacation. School starts on Monday. I am so glad, too, they're driving me crazy. They're really getting on each other's nerves, way too much togetherness. They are so ready to get back among their friends and into a routine. I did join a couple of other challenges, too. I created a round card for Crazy 4 Challenges (shaped card) and Make My Monday challenge (bugs & birds) and for the fun of it, Raise the Bar (anything goes). 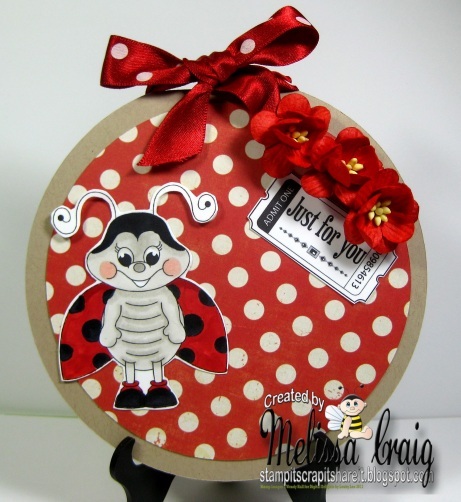 Here's Libby the Ladybug up close. You can also see that I used a sentiment from Ticket Sentiments. 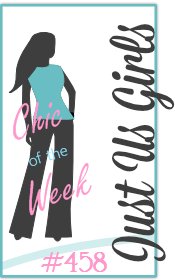 I thank you for stopping by my little blog today and I hope you have a super great day! This image was such a joy to color. It makes me think of my kids when they were little. I love how this turned out. The paper is fun, too. I do hope you join us this week - its sure to be a lot of fun. Have a super week! 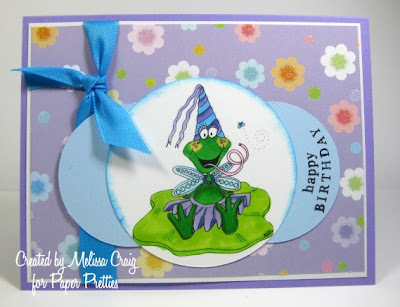 So I am the last stop on the Paper Pretties Birthday Blog Hop. I hope you enjoyed the hop as much as I have. The stamps over at Paper Pretties are awesome!! Have you been just drooling over the new stamp release sneak peeks like I have? Wow!! Well, here's a birthday card I made, not for myself, but to just celebrate birthdays in general. 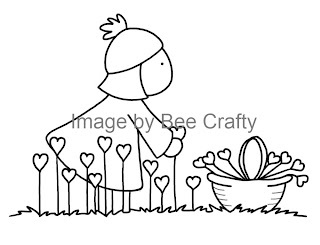 My card is made with a digi stamp called Feronia. I made it using a great sketch from Just Us Girls. 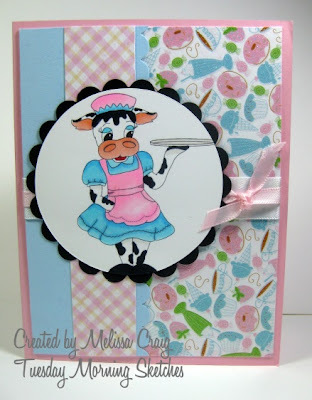 I think she is just too cute and this card would be perfect for a little girl. I started to make it for my Monthly Card Traders group, but cards take on a life of their own and this fun little fairy decided she was playing in a different challenge. Thank you for stopping by today and hopping with us! Good Morning everyone! I hope you're all enjoying your weekend. I am having a really fabulous one. I have been spending time with some friends and been having a great time. Speaking of friends, one of them commissioned me to make 3 cards for her daughter who turned 5 over the weekend. She is really into the Disney Princesses. 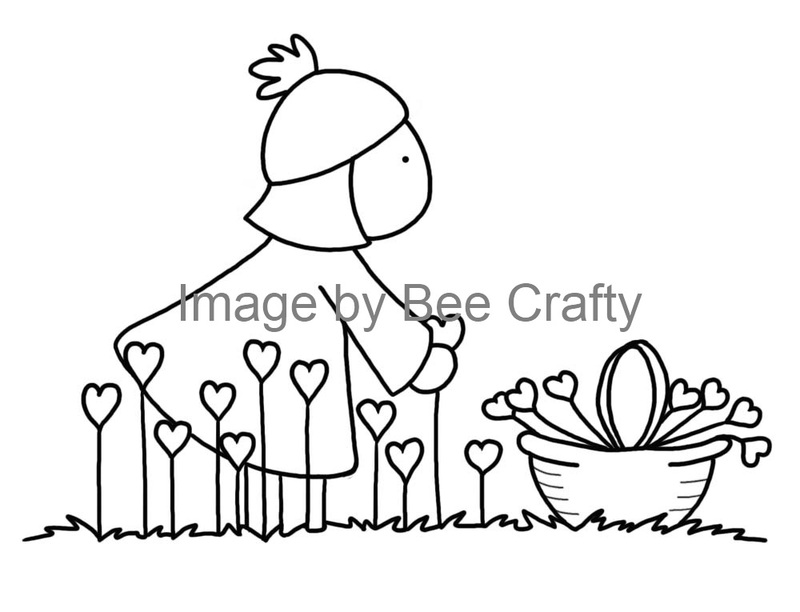 So I set out to find some fun coloring pages which are digi stamps on a large scale, to create these cards. Here's what a I created. This first one is my favorite. 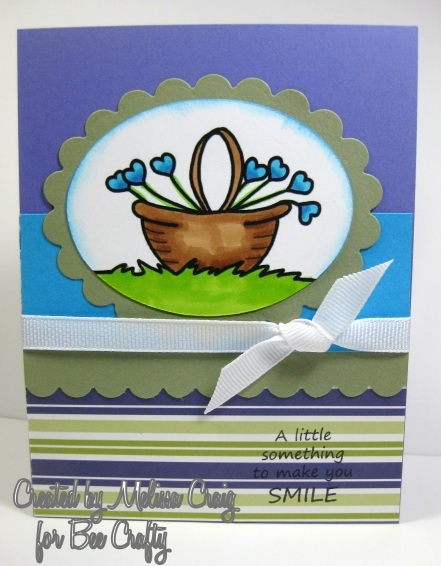 I am so pleased with how this card came out. I was able to use some flowers that I have had for so long. I did use a sketch from jac-inks Papercraft Challenges. 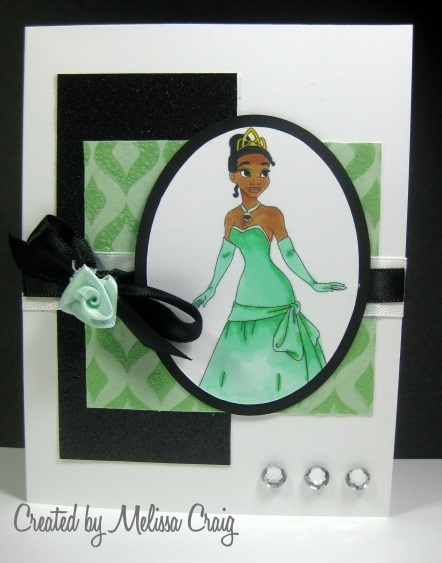 This is Princess Tiana and I am really proud of how I colored her. I haven't done African-American very often and I think I got her fleshtones just right. The picture doesn't do this card justice. The papers used are glitter papers and look so pretty. 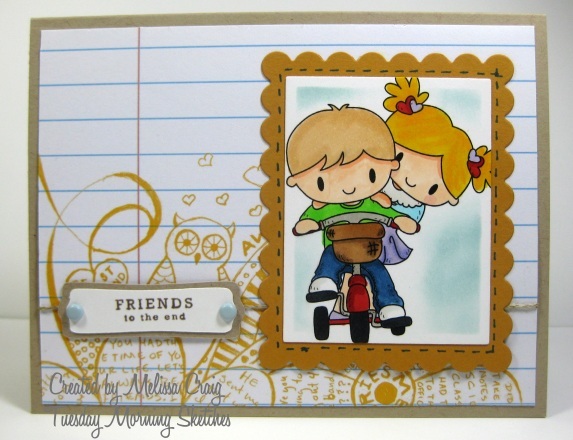 The layout is from Sweet Sketch Wednesday. It's been a long time since I've used one of Arlana's sketches, too long! And my last one features Snow White and my favorite little Dwarf, Dopey. This is fun card! 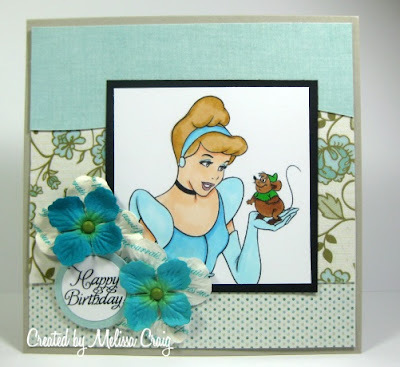 The sketch is from Sketch and Stash and my stashed item are the rhinestone flowers. Well that's all I have to share with you today. Now I need to work up my energy to get all my cards done today. It's been a lazy Sunday. I started this post this morning and am finally finishing it at 4:20 pm! Crazy!! Have a super day. Good Morning! 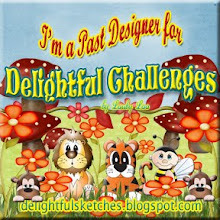 It's Thursday, there's a new release and a challenge over at Delightful Challenges. Wendy has created some really sweet Autumn sets. There's coordinating digi-paper, sentiments and accessories, too. My picture doesn't feature the stitching very well, but what I did was took my little perforating tool along the edges of my decorative paper to create the stitching. Thank you so much for stopping by today. I hope you have a fantastic day and that you'll join us for the challenge. Good Morning! It's Tuesday and we have a super fun sketch at TMS for you this week. 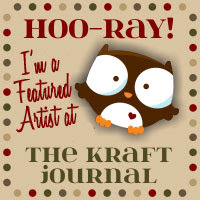 The sketch was created by Kathy Curry and it's a fun one. Our sponsor this week is Digital Delights by Louby Loo and I am so thankful to Wendy for supplying us with some really awesome images to play with. Doesn't this card take you back to something like Grease meets animal farm? LOL I love the paper, it's from one of favorite collections from DCWV. I hope you enjoy your Tuesday and that you join us this week. You'll have fun, I promise! As you can see, I focused in on the basket. I did this by importing Whimsical Girl Heart Garden into my photo editing software (I use paint dot net). I drew a crop box around the basket and then with the white paint brush I "erased" what I didn't want. Then did a save as, naming it the same name with altered behind it. Now, just a word on altering digi images. I'm sure everyone knows better, but please respect the artist. If you alter their image, give credit back to the artist and do not attempt to sell this as your own image. As I said, I know you know better - but still needed to be mentioned. 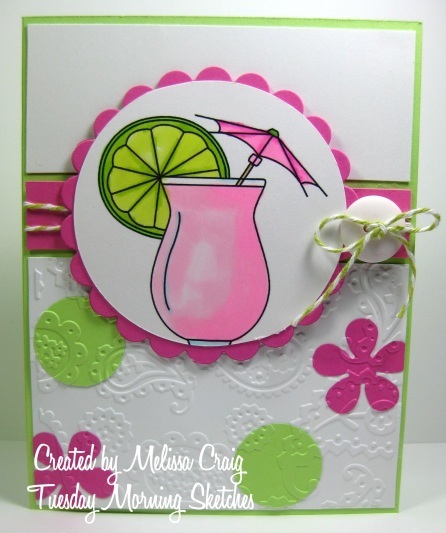 Speaking of giving credit where credit is due - I used a fabulous sketch from Card Patterns to create this card. Hello everyone! I hope you all had a fun and relaxing weekend. Mine was a good one, just over way too quickly. But aren't they all like that? My usual Sunday day of stamping was pretty limited, too. I think I did more work on my computer to get things organized for the DT responsibilities then I normally do. So, now I get to work under pressure. Oh well, not new to me. 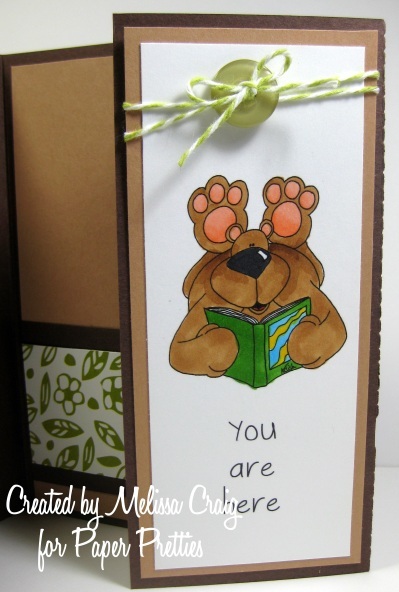 Now, many of you may remember that a challenge over at Tuesday Morning Sketches recently was to make a detachable bookmark card. It wasn't a very popular challenge, I am sad to say, but it was one of my favorites. And with this new release at Paper Pretties, it was a perfect match! What do you think? This is, of course, the newest release this week. It's called A Beary Good Read and as I said, it fit perfectly with this type of card. I love how it turned out. He does come with some sweet sentiments, even and outside/inside one - but I left him sentiment free. Here's the inside where I used the same image for the bookmark, just a bit smaller and added my own computer generated "sentiment." Here's a picture of the other digital set that is releasing today, too.